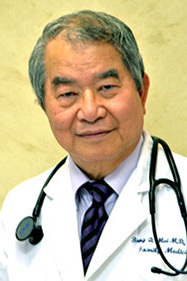 Dr. Bong Mui has been proudly serving the Eastern Louisiana community and Southwest Houston community with comprehensive family medicine for over 30 years. Born in Saigon, Dr. Bong Mui started to pursue his goal of becoming a medical doctor at the Faculty of Medicine of Saigon, Vietnam. He continued to expand the horizon of his medical education at Tulane University in New Orleans, Louisiana where he both obtained his Master degree in Public Health and Tropical Medicine and a prestigious Doctor of Science (ScD). A few years after, he completed his residency at Louisiana State University. After spending over 20 years practicing medicine in Louisiana, Dr. Bong Mui decided to move to Houston and continued the same purpose of caring for his patients. His practice has been focused on the wellness and health of the entire family. His specialty in adult medicine to include preventive medicine, immigration physical, medical weight loss, obesity and wellness care. Skilled in providing management of chronic diseases like diabetes, hypertensions and acute illnesses like sinusitis and allergies, Dr. Bong Mui will be able to manage the majority of health care needs you have. He accepts patients ages 5 and up. Dr. Bong Mui is fluent in English, Vietnamese, Spanish, French and Tagalog. When he is not in his medical practice, he enjoys painting and writing poetry. He is the author of two books of poems in Vietnamese, which are complications of poems, paintings and love songs.